Many of the books on learning styles devote 98% of their text to identifying learning styles, then spend the remaining 2% telling you how to apply this knowledge. They are long on diagnosis and short on prescription. 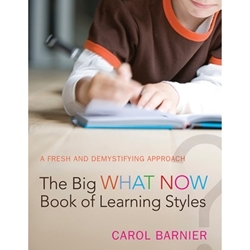 Carol Barnier knows from her own experience and from interactions with educators all across the country that while people are certainly interested in the "why", they are in urgent need of the "how", or the big "what now?" They need perfectly clear and practical information that can be applied tomorrow. Carol is a homeschooling mom who speaks coast to coast at homeschool conferences and is a frequent radio show guest. With much laughter coupled with highly practical solutions, Carol shares strategies that encourage us to open the gift that is our child, to see our child and ourselves as God designed us each to be, and to fulfill his plan for each of us, educationally and in daily living. Carol and her husband homeschool their three children in the beautiful Berkshire Hills in Connecticut.